Anchor Yachts regrets to inform you that the Valiant Factory has decided to suspend production of new boats until demand increases. We are proud to have been an authorized Valiant Dealer for over 14 years and hope that they will resume production in the near future. Therefore, we encourage you to review the information on Valiant Yachts and then contact us if you have additional questions or wish to discuss anything further. Valiant Yachts are built in Texas, USA. They have long been widely recognized as the benchmark by which all other offshore cruising sailboats are measured. Designed by Robert Perry and built in America since 1972, these yachts have earned their reputation the hard way, one circumnavigation at a time. In fact, Valiants have logged over 3,000,000 offshore miles including circumnavigations and short-handed ocean crossings, more than any other brand of sailboat ever built! 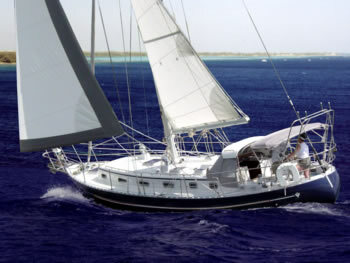 Sail America nominated the boats to the American Sailboat Hall of Fame. And even though they don’t claim to be racing boats, they have won numerous transoceanic, coastal and club races over the years. If you’re serious about cruising, you should know more about Valiant Yachts.